Mish's Global Economic Trend Analysis: Italian Banks Hammered; Bad Loans Hit €201 Billion; End of Draghi PUT; Get Out Now! Italian Banks Hammered; Bad Loans Hit €201 Billion; End of Draghi PUT; Get Out Now! Things don't matter until they do. For whatever reason, things in Europe are starting to matter. For example, Bloomberg reports Italian Banks Lead European Decliners on Bad-Loan Concerns. Italian banks dropped in Milan, leading declines in the European Stoxx 600 Banks Index, reflecting investor concerns about lenders’ levels of bad debt as the European Central Bank seeks to toughen scrutiny of the region’s non-performing loans. Banca Monte dei Paschi di Siena SpA, bailed out twice since 2009, slumped 15 percent to 76.6 cents in Milan, a fresh record low. Unione di Banche Italiane SpA fell 7.3 percent, while Banco Popolare SC declined 6.7 percent. Europe’s 46-member Stoxx 600 Banks Index decreased 1.9 percent to the lowest since November 2012, bringing losses this year to 15 percent. Italian banks’ bad loans reached a record high of 201 billion euros ($219 billion) in November, with record-low interest rates and a struggling economy squeezing profit margins. The ECB’s Single Supervisory Mechanism is seeking additional information about lenders’ non-performing loans in order to tackle bad debt across the region, a spokesman said, confirming a Sunday report by Reuters. “A task force on non-performing loans is reviewing the situation of institutions with high levels of NPLs and will propose follow-up actions,” the central bank said. In Italy, the government has been struggling to win approval for a bad bank to help speed up disposals of soured loans. Tensions between the country and the European Commission mounted earlier this month when Juncker publicly questioned Renzi’s criticism over an alleged lack of flexibility. Italian market regulator Consob imposed a ban on short selling of Monte dei Paschi’s stock for the remainder of Monday’s session through Jan. 19, in an attempt to stabilize shares of the world’s oldest bank, which have dropped about 34 percent this year. Subordinated and senior bonds in troubled banks including Monte dei Paschi, Banca Popolare di Vicenza and Veneto Banca have slumped to record lows this month. Monte Paschi’s 379 million euros of 5.6 percent junior notes fell more than 10 cents to 71.7 cents on Monday, surpassing the previous record low of November 2011. Via translation from El Economista here are a few snips on Italian bank woes. Construction of a bad bank has been a constant headache for the Italian authorities. Minister of Economy, Pier Carlo Padoan, acknowledged that the government's intention is to create a bad bank for toxic assets, but coffers of the country do not have enough money to engender this entity. Giuseppe Castagna, CEO of Banca Popolare di Milano, acknowledged in June that "there is not enough money to make a bad bank in Italy." Now, the choice is private investors, something that seems unlikely considering that the carrying amount granted by the Italian authorities to these dubious assets is too high. End of the Draghi PUT? Bloomberg reports European Bank Stocks Rewind to 2012 as Draghi Rally Wanes. 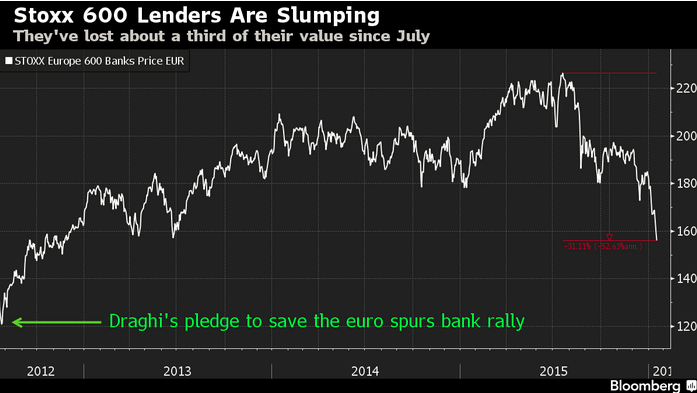 The bank-stock rally sparked in 2012 by Mario Draghi’s pledge to save the euro is fizzling. Lenders in the benchmark Stoxx Europe 600 Index have erased about a third of their value since reaching a four-year high in July, falling to their lowest levels since November 2012. The European Central Bank president’s vow that year to do whatever it takes to avert a breakup of the region stoked investor optimism and helped bank shares almost double in the three years that followed. I repeat my call for depositors in Italian banks, just as I did numerous times before Greece restricted bank withdrawals: "Get out now!"